SendFuse is now free to try for 14 days, then $47 per month for access to the full functionality. You’ll be billed automatically each week for the total number of postcards sent or title reports pulled that week. Billing information can be adjusted at any time in the settings area of your dashboard. It’s all via text message. When you signup, you’ll receive a text message to the phone number you signed up with. Your SendFuse bot will intuitively talk you through everything to make sure you don’t mess anything up. That means you can give it to birddogs and they can’t mess up either! I’m using SendFuse already… how do I get the new features? It’s super easy! Just login to app.getsendfuse.com, then click settings in the menu on the left. Over on the right of the screen you will see the subscribe link for the 14 day free trial. Do we have to be InvestorFuse members? Can we add our own sequences? At this time, no, but you can EDIT our pre-built sequences! 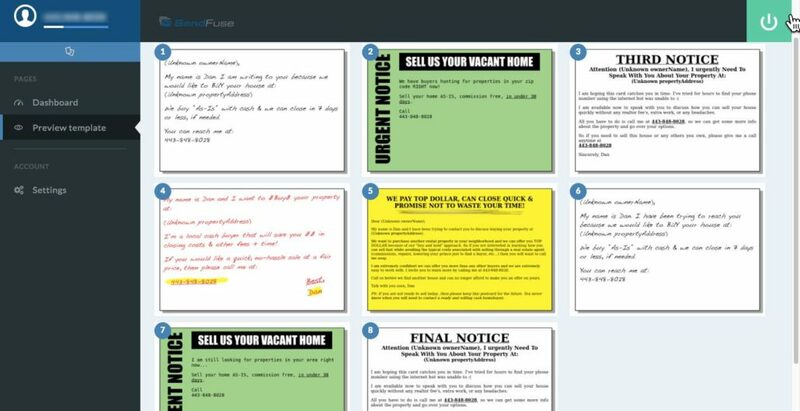 All owners will receive our proven sequence, starting with the first postcard right when you submit your property. The following postcards are sent out over a pre-defined period of time over 6 months. One less thing to worry about, and if you want to go in and change the wording, you can do so through your dashboard settings. Absolutely! You can add users to your account in your dashboard company settings. They’ll receive a text message with instructions so they can start marketing for you right away. How up to date is the owner name and address information? We pull our data from the same public data feed as ListSource, so our data will be as accurate as all the major providers. However, we can’t guarantee it’s going to be 100% accurate all the time because it doesn’t reflect real-time real estate transaction details and may very market to market. How can I prevent mail from going to junk addresses? SendFuse will only send mail to INDIVIDUAL absentee owners (Not LLCs, trusts, or any institutions). If the owner doesn’t make the cut, we add your property to your “Watch List” section so you don’t forget about finding that property. How do I stop a sequence?? Simple! Go into your SendFuse Dashboard, search the address, and click on “Cancel” to stop it.